The Pilates Method is a system of exercises based on science and designed to create a long, lean, and healthy body while engaging the mind. Pilates is a thoughtful exercise guided by six principles: control, concentration, centering, breath, precision and fluidity. It involves classical sequencing of one exercise done after another. The Pilates Method is a complete body conditioning that incorporates both apparatus and mat work. 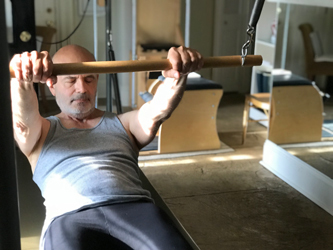 The apparatus work allows the body to move and encounter resistance with springs, without placing stress on the joints; mat work is a series of floor exercises that work the entire body from top to bottom. Prepare to strengthen and stretch while increasing the work of each motion. 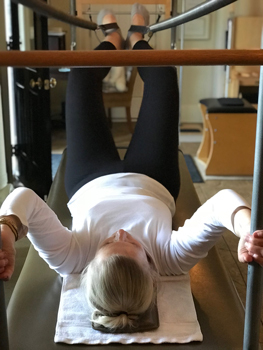 Pilates benefits include increased abdominal strength, flexibility, length and tone of muscle, postural improvements, balance and coordination, injury prevention and rehabilitation. Ready yourself to activate your muscles, develop and increase your body awareness, and finally, expect your workouts to fly by. The Pilates Method can benefit people of any ability, age or fitness level.